Micro Vacuum Attachment Kit is 7 piece micro vacuum cleaner attachments kit that provides miniaturized cleaning tools for use with full-size vacuum cleaner. It fits all vacuum cleaners that accept standard 1 1/4 inch (32 mm) inside diameter attachments and friction-fit wands. 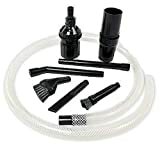 Schneider Industries 7 Piece Micro Vacuum Attachment Kit works best with Miele, Bosch, Sebo, Hoover, Eureka, Shark, Electrolux, Bissell, Dirt Devil, Fuller Brush and many more vacuum brands as long as they have friction-fit wands and hoses. This attachment kit does NOT fit any clip mounted (which ‘click’ when being connected) wands or hoses that are commonly found on Dyson, Shark and similar vacuums. Micro Vacuum Attachment Kit attachment kit also comes with 1 3/8 inch (35 mm) adapter. – a micro crevice tool. Using these attachments, one turns full size vacuum cleaner into a powerful micro vacuum with ease, enabling cleaning of dust and dirt from just about any tiny, narrow, inaccessible area like from desktop computers, laptops, camera lenses, printers, office equipment, DVR’s, model railroads, dollhouses, delicate figurines, sewing machines etc. Best of all, this attachment kit comes at a very affordable price. For more reviews and recommendations, check Micro Vacuum Attachment Kit Amazon link (link opens in the new window).